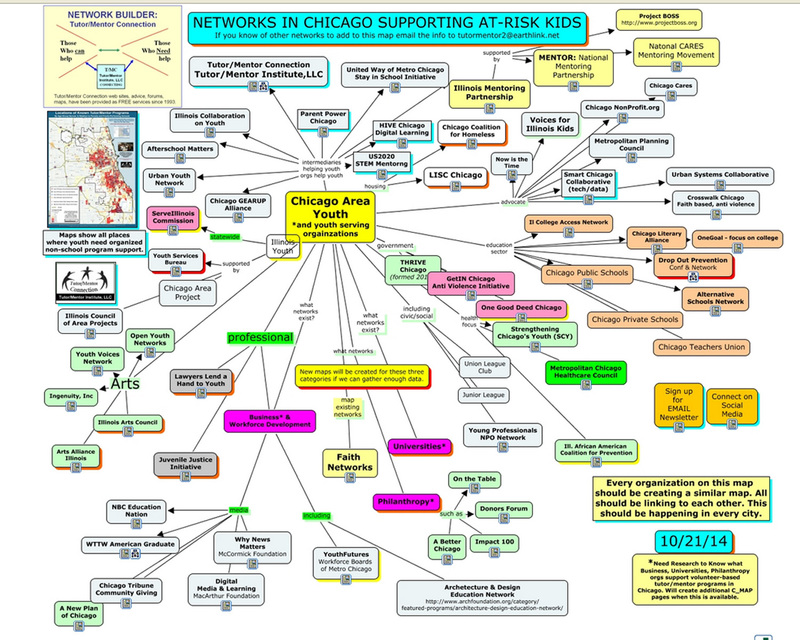 This graphic shows many of the intermediary organizations operating in the Chicago region, each with a goal of helping youth. You can find links to each web site here. The conference is offered two times a year. However it is part of a year-round Collaboration Strategy, inviting all of these organizations to connect, share ideas, and help tutor/mentor programs grow in many places. This animation shows the T/MC event strategy, and illustrates how individuals from many places can take leadership roles. 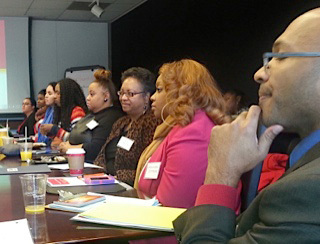 Interns from IIT, Loyola, Northwestern, Michigan, and other universities are doing this work, which illustrates a creative way for others to use their talent to mobilize resources for tutor/mentor programs in Chicago and other cities. Speakers and workshop presenters are volunteers! All of the people who make time to do presentations are volunteers, who partner with the Tutor/Mentor Connection to make this conference possible. Visit this page to find archives showing speakers who participated in past conferences. These are the type of presenters who will participate in the future conferences. All sponsor donations for the 2015 conferences are tax deductible thanks to Becoming We the People, a 501-c-3 serving Northwest Indiana, agreeing to become fiscal agent for the 2015 conferences. Jordan Hesterman, Executive Director of BWTP has been helping organize conferences since 2011. 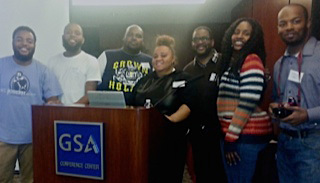 As a 501-c-3 her agency is able to accept conference sponsor donations, and help attract funding to support the conferences and our collective efforts to help youth tutor/mentor programs grow in the Chicago region and Northwest Indiana. Want to help plan the Tutor/Mentor Conferences? The Tutor/Mentor Connection (T/MC) is now a program of the Tutor/Mentor Institute, LLC. We continue to depend on the volunteer actions of many individuals and organization to organize the May and November Conferences each year. All of our speakers are volunteers who donate their time. Many come from other cities and pay for their own travel and lodging expenses. Without this help, we could not keep the fees for the conference so low or offer as many scholarships as we do. In this way, all of our speakers are partners in this effort. We thank you all. This Talent Map shows the range of skills needed to support the growth of high quality tutor/mentor programs in Chicago and other cities. If you have these skills, and share our vision, please introduce yourself and offer your help and/or partnership. We seek volunteers and partners from business, faith groups, colleges and area Tutor/Mentor Programs who view the T/MC conference as part of their own commitment to make more effective volunteer-based tutoring and/or mentoring programs available to economically disadvantaged kids living in neighborhoods with high violence, high poverty, and many poorly performing schools. Partners can come from businesses, universities, local tutor/mentor programs, schools, foundations, and any sector of society. They can even come from beyond Chicago. They even come from other countries. Would you like to bring your network and knowledge to this conference? Contact us now!